Preferred Habitat: Woodlands, usually near water. Seasonal Occurrence: Occasional fall through spring. 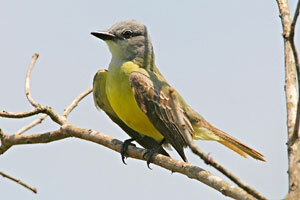 Notes: Couch's Kingbirds are common in the Rio Grande Valley. They are only occasionally found on the upper Texas coast. They are similar in appearance to Western Kingbirds. The best identification marks to look for are: dusky brown, tail, larger, heavier bill, and yellow chest plumage which extends up to the throat.